A Real DOUBLE Suprise ! Show how thin your hip pocket wallet is and then open it up to produce a shot glass!! Close the wallet and then reopen to produce a small bottle of liquid (Airplane size liquor bottle). The wallet can also be used to perform card to wallet and can be carried everyday. Bottle from Wallet - Leather A Real DOUBLE Suprise ! 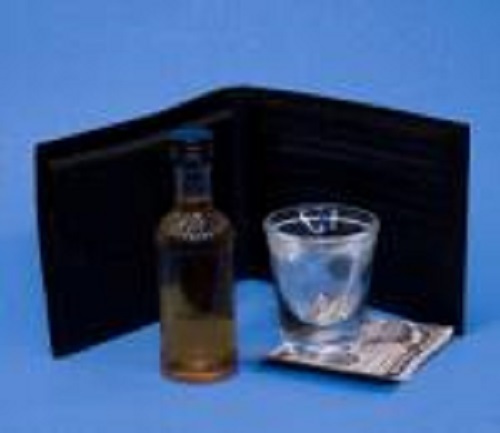 Famous Bottle from Wallet Show how thin your hip pocket wallet is and then open it up to produce a shot glass!! Close the wallet and then reopen to produce a small bottle of liquid (Airplane size liquor bottle). The wallet can also be used to perform card to wallet and can be carried everyday.